WONJU, Gangwon Province ― Hansol Museum, home to a lifetime art collection of the founder and adviser to Hansol Group Lee In-hee, the eldest daughter of Samsung’s founding chairman Lee Byung-chul, opened its doors to the public on Wednesday. 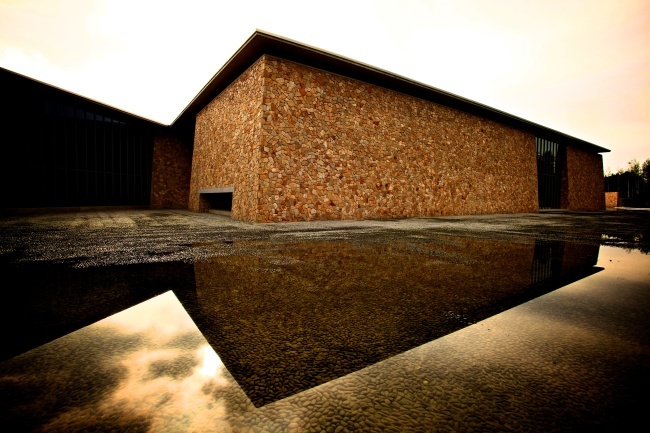 The museum attracted great attention from the public even before its opening with some big name art figures involved in the project, such as Japanese architect Tadao Ando, who designed the museum, and American artist James Turrell. Sitting next to Oak Valley, one of Korea’s biggest resort towns run by Hansol, the museum is set in the pristine nature of Gangwon Province. “The museum serves a different role from other art museums. It is a museum the like of which has never been seen. Our goal is to create a new paradigm for the future of museums,” Oh Kwang-su, director of the museum, said during a press conference on Wednesday at the museum. “The museum is a space that creates harmony between nature and human beings and nature and art. Not only artworks on display inside the museum, but the outside gardens become art. The museum aims to create a place that offers sound rest and meditation through art,” said Oh. The museum is designed by Tadao Ando, who incorporated natural materials found in the surroundings into the building’s simple geometry. Reminiscent of his previous museum designs, the building stands as a work of art that beautifully sits on a mountain top, slightly higher than Mount Namsan in Seoul. 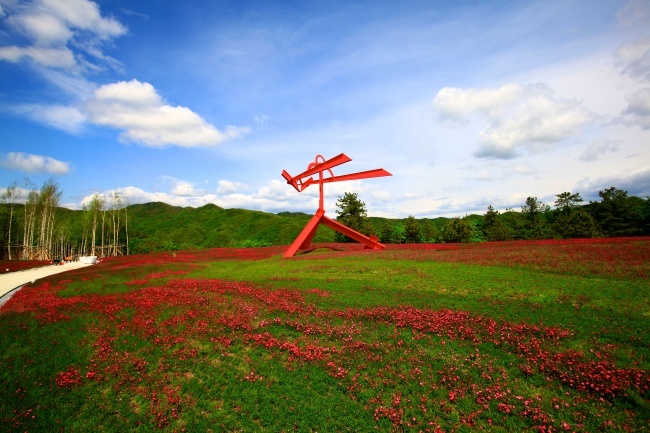 The building is surrounded by three gardens, which serve as open stages for famous sculptural works such as American artist Mark di Suvero’s red steel sculpture “For Gerard Manley Hopkins” standing in a field of china pink flowers, and another red steel sculpture, “Archway,” by Alexander Liberman standing in the pond of the water garden. More sculptures, such as Henry Moore’s “Great Lying Female Figure” and Bernar Venet’s “Three Indeterminate Lines,” stand with other stone hills designed by Ando, who was inspired by the tombs of the Silla Kingdom. At the end of the stone garden stands Asia’s largest museum dedicated to American artist James Turrell. Turrell is famous for works that explore people’s perceptions of light, space and color. The 70-year-old artist is expected to hold a retrospective at New York’s Guggenheim Museum in June. For the inaugural exhibition, the museum is showcasing more than 100 works from Lee’s art collection, including works by Korean modern artists of the 20th century such as Kim Whan-ki, Park Soo-keun, and Yoo Young-guk. The collection includes rare artworks that haven’t received much attention, such as paintings by Jeong Gyu, known as a sculptural artist, drawings by Park Ko-suk and paintings by Lee Qoede, who defected to North Korea in 1953 after the Korean War. The paper gallery, devoted to the history and development of paper, presents a collection of traditional craftworks made by women in the old days. The exhibition offers a glimpse of the old life of Joseon with works ranging from women’s hair ornaments, a mulberry paper sewing box and thread cases to a traditional Korean hat case. Sculptural works by Korean artists are also on show in a separate room of the museum, offering a comprehensive guide to modern sculptures in Korea. The inaugural exhibition continues through Feb. 28 in 2014. Admission is 12,000 won. Admission to the inaugural exhibition and the James Turrell Museum costs 25,000 won. Guided tours start at 11 a.m. and 2 p.m. For more information, visit www.hansolmuseum.org, or call (033) 730-9000.